Next, we’ll turn our attention to Pets and Supplies. We’ll see some differences from Pet Food as the spending in the Supplies segment is more discretionary in nature. There are other factors too. Many supplies categories have become commoditized so pricing changes (CPI) can strongly impact Consumers’ buying behavior in this segment. Supplies’ Spending can also be affected by the spending behavior in other segments, especially Food. Consumers often trade $ between segments. In 2015 Consumers spent $5.4B more on Pet Food. They helped pay for this by spending $2.1B less on supplies. In 2016, things turned around as Consumers value shopped for premium foods but spent $0.94B more on Supplies. 2017 was different. It was a year of across the board value. Consumers reacted and spent significantly more in 3 industry segments, including Supplies – +$2.74B, a 17.3% increase. 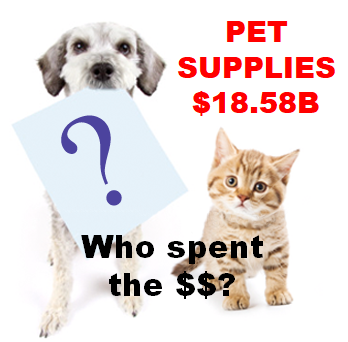 Let’s see which groups were most responsible for the bulk of Pet Supplies spending in 2017 and the $2.74B lift. The first chart details the biggest pet supplies spenders for each of 10 demographic categories. It shows their share of CU’s, share of pet Supplies spending and their spending performance (Share of spending/share of CU’s). Although their share of the Pet Supplies $ may be different from their share of the Total Pet $ or Food, all of the big spending groups are the same. The categories are presented in the order that reflects their share of Total Pet Spending. This highlights the differences in importance. All 10 of the big groups have over a 60% market share. Pet Food had only 7. We’re also back to 6 groups with performance of over 120%. Pet Food had only 5 as Education dropped out. Higher Education correlates with higher income and income is more important in supplies spending. In Pet Supplies spending, Homeowners and Married couples had a big gain in share and the 35>64-yr olds entered the 120+% performance club for the first time. The Everyone Works group had a big drop in share as the # of Earners in a CU became less important. Also, of note, Suburbanites have a significantly larger share of spending on Supplies than they do for Food. Race/Ethnic – White, not Hispanic (84.2%) down from (85.5%) This large group accounts for the vast majority of spending in every segment. Their performance rating was stable at 122.9%, but this category fell from #3 to #4 in terms of importance in Supplies Spending. The loss in rank was due to a big share gain by Homeowners. Minority groups account for 31.5% of all CUs but spend only 15.8% of Supplies $. This is primarily due to lower income for Hispanics and African Americans and a lower rate of pet ownership in African American and Asian American CUs. Housing – Homeowners (79.4%) up from (74.9%) Homeownership is a major factor in pet ownership and spending in all industry segments. In 2017 it had a major gain in share of Supplies $ and its 126.2% performance, moved it up to 3rd place from 5th in terms of importance for increased Pet Supplies spending. All Homeowners spent more while Renters spent less. However, the bulk of the spending lift – $2.1B (77%) came from Homeowners with a mortgage. Income Over $50K (71.3%) up from (69.3%) With a performance rating of 138.8%, CU income is the single most important factor in increased Pet Supplies Spending. The increased discretionary nature of much of Supplies spending pushes the performance level slightly higher than that of Pet Food. However, it is still significantly below the Service Segments. Higher Income still generally generates Higher Pet Supply Spending. Age – 35>64 (64.1%) down from (64.2%) Traditionally, Supplies Spending skews more towards the younger groups. The 35>64 group maintained their dominance even though their market share remained flat. Supplies Spending was up in all age groups, but it was primarily driven by the 55>64-yr olds. The number of CUs in the 35>64 group fell by 800,000, all in the 35>54 age range. However, their individual CU Spending on Supplies had a strong increase. The result of this was that their performance level increased to 120.0% and they joined the 120% club in 6th place. Education – Associates Degree or Higher (65.6%) up from (63.1%) Unlike Food, Higher Education actually gained market share. Income generally increases with education and we see the impact of this in Supplies. Their performance level rose slightly rose slightly from 122.0 to 122.2%. but they fell from 4th to 5th in importance for generating greater Supplies spending. This drop in rank was also due to the spectacular spending year by Homeowners. 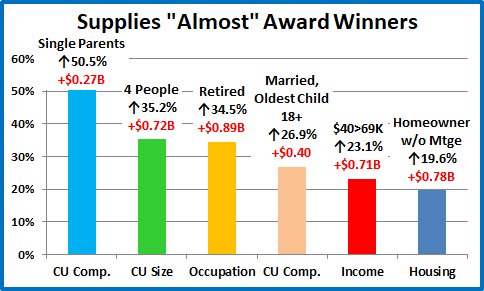 CU Composition – Married Couples (64.2%) up from (59.9%) Married couples are a big share of $ and perform at 120+% in all segments. They gained significantly in Supplies Spending share, as all segments spent more, especially Couples Only. Their performance grew spectacularly from 123.2% to 129.7% and they remain 2nd in importance. # Earners – “Everyone Works” (62.5%) down from (67.0%) In this group, all adults in the CU are employed. Income is important in Supplies Spending, but like Food, the number of Earners has grown markedly less important. Their performance is 109.1%, down from 116.4%. This is still higher than Food but it reflects a great year by 2+ people CUs with only 1 earner. That group. along with retirees, spend a lot of money on Supplies – 37.5% of Total $. Area – Suburban (63.0%) up from (62.0%) Suburban CUs are the biggest spenders in every segment. They held their ground in Supplies. A relatively high performance of 113.3% reflects the lower share of Supplies $ in Central Cities. The biggest spending groups for Pet Supplies are the same as Total Pet and Pet Food. However, the discretionary nature of Supplies causes spending to be more impacted by income than Food. Groups associated with higher income, like Education and # Earners, have higher performance than in Food. Homeownership and Marriage had the most growth in Supplies $. Having 6 groups with 120+% performance also indicates greater disparity between segments. Now, we’ll look at 2017’s best and worst performing Pet Supplies spending segments in each category. Income matters in Supplies spending. The 227.2% Performance by the $200K> group is 27.4% better than their performance in Food. 7 of the 11 winners for best performance had the highest income of any segment in the category. Three came in 2nd – White, not Hispanics, Self-employed and West. 2 Person CU’s were 4th but are more focused on pets. In Categories associated with Income, including # Earners, Occupation and Higher Education, the disparity between the best and worst performers grew in 2017. Any gains that were made occurred in the middle ground. CU Composition – This year’s winner is Married Couples with the oldest child over 18. They finished in a virtual tie with the Oldest Child 6>17. This reflects the strong year that was enjoyed by the entire 35>64-yr age range. Singles are once again last and their performance fell significantly from 65.4% to 60%. # in CU –In 2017 the performance of 2 to 4 people CUs was very close. 5+ underperformed slightly at 97.4% and then we have…Singles. It just takes 2. It’s time to “Show you the money”. Here are segments with the biggest $ changes in Pet Supplies Spending. Housing – In 2017, Homeowners spent more. Renters spent less. In 2016 all segments spent more. Comment – Homeowners with a mortgage flipped from last to first. In 2016 they accounted for 49.6% of Supplies $. In 2017 that grew to 53.9% as they produced 78% of the increase. Race/Ethnic – The White, Non-Hispanics share of Supplies spending is 84.2%, but only 75.5% of the lift. Comment – African Americans came in last but had a 26.9% increase. Of all the minority groups, Hispanics had the lowest percentage of increase (+20.5%). Supply Spending is very slowly becoming more equal. However, we should note that White, not Hispanics finally broke their spending record of $14.8B. That record was set in…2014. # in CU – It’s simple. All groups registered an increase, but 2 People CUs led the way. Comment: In addition to 3 People CUs, Single people also underperformed with only a 4.1% increase. The key CU numbers in 2017 were 2, 4 and 5 or more. # Earners – 1 Earner, 2+ CUs rebounded after a decrease in 2016 to post the biggest increase. Comment – Income is a factor, but the # of Earners was less important in 2017. All CUs, from No Earners to 3 or more Earners, spent more on Pet Supplies. 2 Earner CU’s came in 2nd , up $0.75B (+11.1%) All other segments had increases below 10%. In 2017, 1 Earner- 2+CUs was the biggest driver (57%) behind the $2.74B lift. Occupation – The widespread growth gets even better. In 2016, 1 group spent less. In 2017, all groups spent more. Comment – Managers & Professionals replaced Self-employed as the highest income group and moved back on top of Supplies Spending. They have now registered 3 straight years of increased Supplies Spending. Blue Collar workers also increased Supplies spending – +9.4%. Nothing like Food, but still an increase. No segment $ trading. Education – All groups were up, but BA/BS Degrees led the way. Comment – The Advanced Degree group was a strong 2nd, up $0.81B (+21.7%). Like the Blue-Collar group, HS Grads w/some College also bought more Supplies, up $0.34B (+11.7%). So, they too had no $ trading for Food. CU Composition – Married Couples Only finished on top, but only 1 segment spent less. 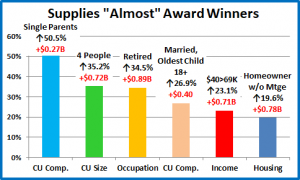 Comment – CUs with children, Married or Single Parents, spent $1.11B more on Supplies. This is 40.5% of the total increase and a radically different pattern from the Food, Service and Veterinary segments. Area Type – Suburbs Over 2500 population flipped from last to first, but all areas spent more. Comment – Rural areas finished last with a 29.9% increase. Their big lift in Food didn’t hurt Supplies’ spending. Income – Last year 3 income groups spent less on Supplies. This year all groups spent more. Comment – The winner is no surprise, but the lift was fairly balanced. The $40>69K group was up $0.72B (+23%). Age – The 55>64-yr Olds led the way in Supplies just like they did in Food, but all groups spent more. Comment: The spending increase was very evenly spread across the age groups with only one group not registering a double-digit percentage increase. The 65>74-year olds were the only group not included in this club as they only spent 8.9% more. By the way, the 75+ group led the way with +31.9%. The <25 group was 2nd, +27%. Region – All groups spent more and the winner and loser are both the same as 2016. The numbers from these segments certainly merit their recognition for Honorable Mention. They also provide further evidence of just how widespread and deep the lift in Supplies’ spending was – Single Parents, 4 People CUs, Retirees, even lower middle-income CUs – $40 to $69K. America spent more on Supplies in 2017. There is another fact that irrefutably shows this. Of 99 individual demographic segments, only 6 had a decrease in Supplies spending. That means that 94% spent more. The problem was limiting this list to 6. While Pet Food spending has shown a definite pattern, Pet Supplies have been on a roller coaster ride since 2009. Many Supplies categories have become commoditized and react strongly to changes in the CPI. Prices go up and spending goes down…and vice versa. Supplies spending has also been reactive to big spending changes in Food. Consumers spend more to upgrade their Food, so they spend less on Supplies – trading dollars. We saw this in 2015. Then in 2016 the situation reversed. Consumers value shopped for Food, so they spent some of the “saved” money to increase their spending on Supplies. That brought us to 2017. It turns out that 2017 was to be significantly different. Both Supplies and Food prices deflated. At the same time the inflation rate in both of the Services segments dropped to lows not seen in recent years or in the case of Veterinary, not seen ever before. Value was the “word” and it was available across the market. One of the first things that we noted was the strong evidence that the upgrade to super premium significantly penetrated the consumer market with major lifts from unexpected demographics like Blue-Collar Workers, HS Grads w/some College, 1 Earner- 2+ CUs and lower middle-income groups. This could have negatively impacted Supplies Spending. However, it didn’t. Supplies’ spending increased in these segments, but it also was very strong in the groups that we have come to expect to be the leaders – Homeowners w/Mtge, Managers & Professionals, College Grads and Married Couples. With an increase in 94% of all segments, there was good news everywhere. We returned to a new “normal”, which far exceeded the old. Among the demographic categories in which a consumer has some control, Higher Income, Marriage, Homeownership and Higher Education are still the biggest factors in increased Supplies spending. Homeownership and Marriage both increased significantly in importance and influence in 2017. While Income remained firmly at the top of the list, there were other changes related to Income which broadened the market for Supplies. The # of Earners became much less of a factor and there also were significant spending gains coming from lower middle-income groups. Although it is not an absolute necessity like Food, the spending behavior on Pet Supplies can also be a reflection of the percentage of pet ownership across a demographic category. In our analysis of Food spending we suggested that part of the spending increase in unexpected segments may have been derived from an increase in the CU percentage of pet ownership. While not as dramatic as the food increase, all these groups also increased Supplies spending which would add support to the premise of more new Pet Parents. The other trend that we saw in Food spending was a “movement” for more space – Rural Areas and Suburbs <2500. While not as dramatic as the lift in Food, those 2 areas also had the biggest Supplies spending lift in the category, +29%. Finally – The “Ultimate” Pet Supplies Spending Consumer Unit consists of 4 people – a married couple, with 2 children, the oldest is over 18. They are in the 45 to 54 age range. They are White, but not of Hispanic origin. At least one of them has an advanced College Degree. Both of them work, running their own business and their oldest child just started a part time, after school job. They’re doing well with an income over $150K. They live in a larger suburb, adjacent to a big city in the Western U.S. and are still paying off the mortgage.